I love washing clothes. 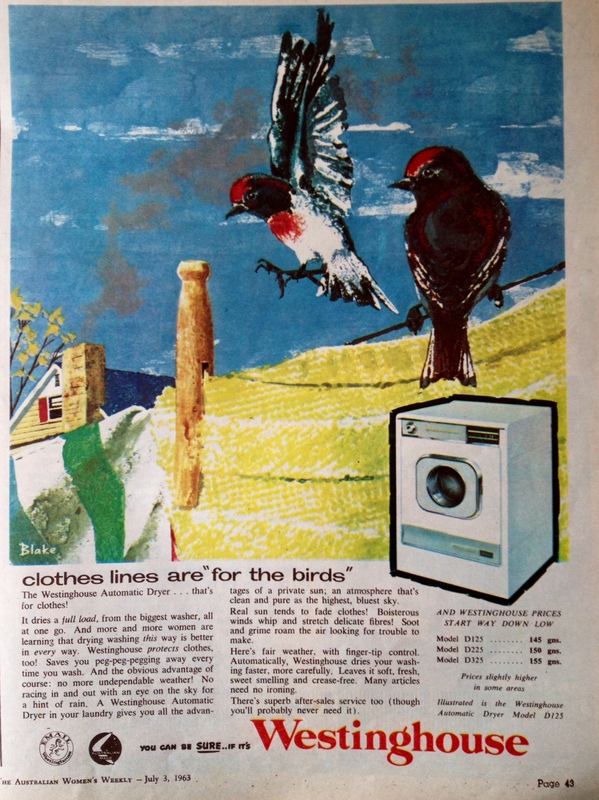 Actually, it’s not so much the washing, it’s more the ‘hanging it out on the line and then bringing in the basket of fresh smelling garments’ that I love. One day I asked myself, why does it make you feel so happy? In reply to this probing question, I was a little surprised to discover that, instead of a thought, an image popped into my mind. It was of a young woman, circa 1960, hanging clothes out on the line, smiling at the sensation of showing how much she cared for her young family. The ‘copy’ used is revealing. 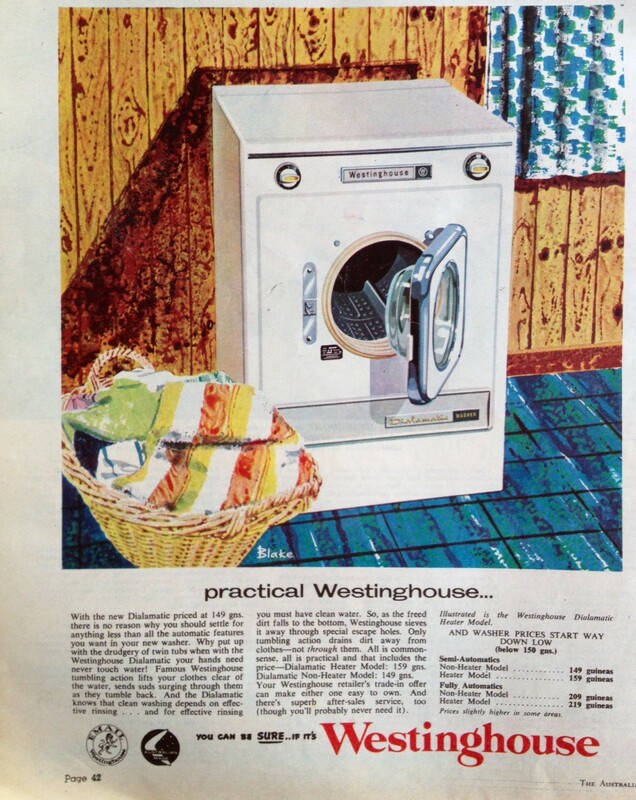 Lines like “why put up with the drudgery of twin tubs when with the Westinghouse Dialamatic your hands need never touch water!” Now that is an incredibly convincing reason to purchase this shining machine, for sure! Clothes lines are so, yesterday. Did you know that, more and more women are learning that drying washing in the Westinghouse Automatic dryer is better in every way? And, that it leaves your washing ‘soft, sweet smelling and crease-free’? I was four years old when these advertisements graced women’s magazines, however my mother would have been the targeted demographic – a young woman in her early thirties, hanging out the washing, caring for her family of three children, due to give birth to her fourth in two months. I have reflected on this observation ever since and I am suspicious that my ‘love’ of clean clothes and sheets, which felt so much as if it represented how much I care for my family, is more precisely a manipulation of that feeling. While I still enjoy the feel of freshly washed clothes, I now make choices, so that my caring includes caring for the planet. Do I really need to use hot water and scented detergents? Do I need to wash as often? Can I resist collecting up all of our son’s ‘dirty’ clothing, transforming it into sweet smelling, crease-free items in order to express how much I care? I’m pretty sure my family know how much I love them, and if I asked them, they would tell me that I don’t need to prove it with a pile of neat washing at the end of the bed. Tags: analysing advertisements, green solutions, sustainable living, washing machine, Westinghouse Dialamatic, young family | Permalink.